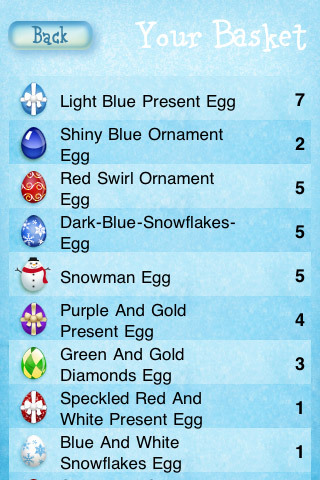 Lightsphere: Hunt for Easter Eggs on your iPhone with Eggster! Want to hear about my new games? Follow me! Eggster is also available for the iPad! Click here for info! Eggster is now available for the iPad! Click here for info! 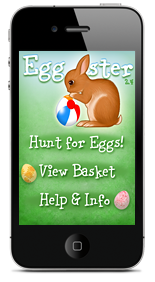 Hunt for Easter eggs on your iPhone with Eggster! 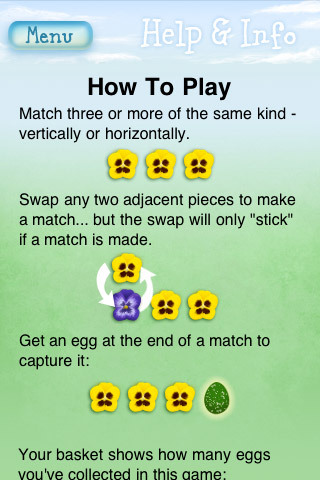 Collect eggs as you match up rabbits, flowers, and other critters in this classic matching game. How to play: Just swap any two adjacent pieces to make a match of 3 or more. Line up an egg at the end of a match and you collect the egg! 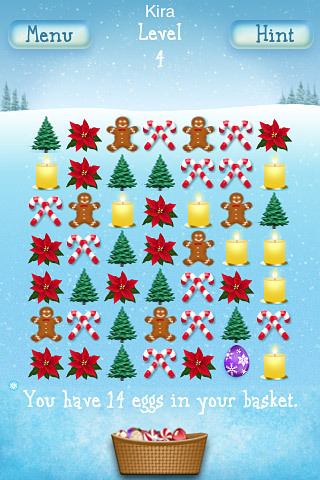 Your basket shows how many eggs you've collected. 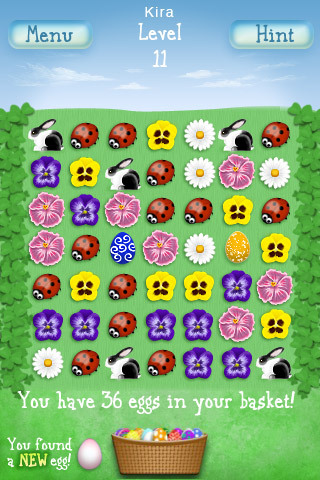 Eggs come in many different colors, and they may be well hidden among all the flowers and critters on the board. Keep your eyes open! 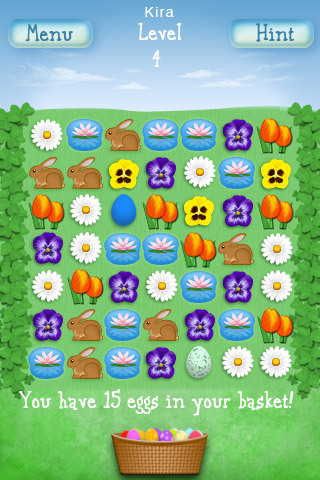 Eggster has four different seasonal boards: the original Spring board, with rabbits, ladybugs, daisies, tulips, and other spring flowers. 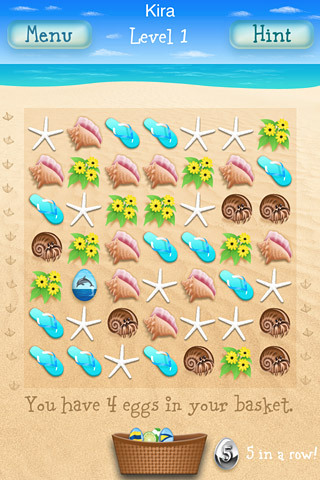 The Summer board features seashells, shorebirds, and nautical-themed eggs. 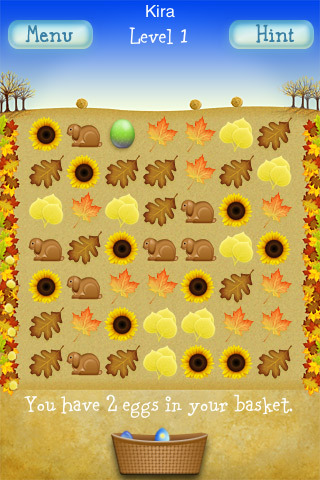 The Fall board lets you match fall leaves, butterflies, and turkeys as you hunt for pumpkins, gemstones, and harvest fruits and vegetables. 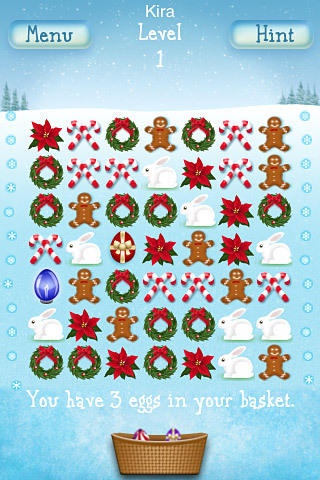 And finally there's the Winter board, where you match up candy canes, Christmas trees, wreaths, holiday bells, and other holiday pieces as you hunt for ornaments, packages, and Winter-themed eggs! For even more eggs (and to support further development!) you can purchase Eggstras egg sets. 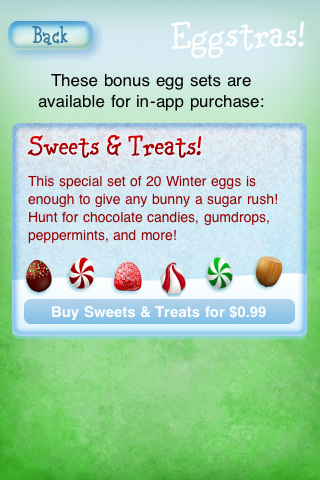 The "Sweets & Treats" set has chocolate eggs, gumdrops, peppermints, and other treats for the Winter board. The "Trick or Treat" set is full of spooky eggs like ghosts, black cats, and bats, as well as candy swirls and jack-o-lanterns for the Fall board. Eggster also supports Game Center! 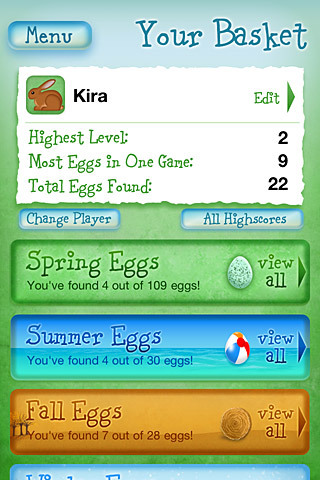 If you're running iOS 4.1 or later, you can earn Game Center achievements and get ranked on the leaderboards as you collect eggs and match pieces. Developer's note: This update has high-res retina graphics for the Spring, Summer and Fall boards. Look for the Winter board in high-res later this fall! All original art and programming by J. Kira Hamilton. Voice fx by Kira & Jennifer Hamilton. The font used is "Carnation" from Fonthead Design. Several of the flower game pieces were drawn from real hibiscus flowers hybridized by Barry Schlueter.